The Event Horizon Telescope (EHT) is a large telescope array consisting of a global network of radio telescopes. The EHT project combines data from several very-long-baseline interferometry (VLBI) stations around Earth with angular resolution sufficient to observe objects the size of a supermassive black hole's event horizon. The project's observational targets include the two black holes with the largest angular diameter as observed from Earth: the black hole at the center of the supergiant elliptical galaxy Messier 87, and Sagittarius A*, at the center of the Milky Way. The idea was first envisioned by German radioastronomer Heino Falcke in 1993. He later co-led, along with Michael Kramer and Luciano Rezzolla, the EU-funded Black Hole Cam project in which theoretical aspects of black hole imaging with VLBI were further developed. The current director of the Event Horizon Telescope collaboration is American astrophysicist Sheperd Doeleman (Harvard-Smithsonian CfA), whereas Falcke (Radboud University Nijmegen) chairs its science council. The first image of a black hole, at the center of galaxy Messier 87, was published by the EHT Collaboration on April 10, 2019. The array made this observation at a wavelength of 1.3 mm and with a theoretical diffraction-limited resolution of 25 microarcseconds. Future plans involve improving the array's resolution by adding new telescopes and by taking shorter-wavelength observations. The EHT is composed of many radio observatories or radio telescope facilities around the world to produce a high-sensitivity, high-angular-resolution telescope. Through the technique of very-long-baseline interferometry (VLBI), many independent radio antennas separated by hundreds or thousands of kilometres can be used in concert to create a virtual telescope with an effective diameter of the entire planet. The effort includes development and deployment of submillimeter dual polarization receivers, highly stable frequency standards to enable very-long-baseline interferometry at 230–450 GHz, higher-bandwidth VLBI backends and recorders, as well as commissioning of new submillimeter VLBI sites. Each year since its first data capture in 2006, the EHT array has moved to add more observatories to its global network of radio telescopes. The first image of the Milky Way's supermassive black hole, Sagittarius A*, was expected to be produced in April 2017, but because the South Pole Telescope is closed during winter (April to October), the data shipment delayed the processing to December 2017 when the shipment arrived. Data collected on hard drives are transported by commercial freight airplanes (a so-called sneakernet) from the various telescopes to the MIT Haystack Observatory and the Max Planck Institute for Radio Astronomy, where the data are cross-correlated and analyzed on a grid computer made from about 800 CPUs all connected through a 40 Gbit/s network. The Event Horizon Telescope Collaboration announced its first results in six simultaneous press conferences worldwide on April 10, 2019. 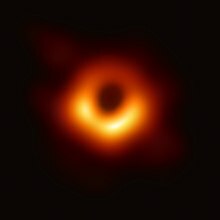 The announcement featured the first direct image of a black hole, which showed the supermassive black hole at the center of Messier 87, designated M87*. The scientific results were presented in a series of six papers published in The Astrophysical Journal Letters. The image provided a test for Albert Einstein's general theory of relativity under extreme conditions. Studies have previously tested general relativity by looking at the motions of stars and gas clouds near the edge of a black hole. However, an image of a black hole brings observations even closer to the event horizon. Relativity predicts a dark shadow-like region, caused by gravitational bending and capture of light, which matches the observed image. The published paper states: "Overall, the observed image is consistent with expectations for the shadow of a spinning Kerr black hole as predicted by general relativity." Paul T.P. Ho, EHT Board member, said: "Once we were sure we had imaged the shadow, we could compare our observations to extensive computer models that include the physics of warped space, superheated matter, and strong magnetic fields. Many of the features of the observed image match our theoretical understanding surprisingly well." The image also provided new measurements for the mass and diameter of M87*. EHT measured the black hole's mass to be 7000650000000000000♠6.5±0.7 billion solar masses and measured the diameter of its event horizon to be approximately 40 billion kilometres (270 AU; 0.0013 pc; 0.0042 ly), roughly 2.5 times smaller than the shadow that it casts, seen at the center of the image. From the asymmetry in the ring, EHT inferred that the matter on the brighter south side of the disk is moving towards Earth, the observer. This is based on the theory that approaching matter appears brighter because of relativistic beaming. Previous observations of the black hole's jet showed that the black hole's spin axis is inclined at an angle of 17° relative to the observer's line of sight. From these two observations, EHT concluded the black hole spins clockwise, as seen from Earth. Images were created independently by four teams to assess the reliability of the results. These methods included both an established algorithm in radio astronomy for image reconstruction known as CLEAN, invented by Jan Högbom, as well as self-calibrating image processing methods for astronomy such as the CHIRP algorithm created by Katherine Bouman and others. The algorithms that were ultimately used were a regularized maximum likelihood (RML) algorithm and the CLEAN algorithm. A schematic diagram of the VLBI mechanism of EHT. Each antenna, spread out over vast distances, has an extremely precise atomic clock. Analogue signals collected by the antenna are converted to digital signals and stored on hard drives together with the time signals provided by the atomic clock. The hard drives are then shipped to a central location to be synchronized. An astronomical observation image is obtained by processing the data gathered from multiple locations. ^ a b c d e f The Event Horizon Telescope Collaboration (April 10, 2019). "First M87 Event Horizon Telescope Results. I. The Shadow of the Supermassive Black Hole". The Astrophysical Journal Letters. 87 (1): L1. doi:10.3847/2041-8213/ab0ec7. Falcke, Heino; Melia, Fulvio; Agol, Eric (January 1, 2000). "Viewing the Shadow of the Black Hole at the Galactic Center". The Astrophysical Journal Letters. 528 (1): L13–L16. arXiv:astro-ph/9912263. Bibcode:2000ApJ...528L..13F. doi:10.1086/312423. Bromley, Benjamin C.; Melia, Fulvio; Liu, Siming (July 1, 2001). "Polarimetric Imaging of the Massive Black Hole at the Galactic Center". The Astrophysical Journal Letters. 555 (2): L83–L86. arXiv:astro-ph/0106180. Bibcode:2001ApJ...555L..83B. doi:10.1086/322862. "Main project website". Archived from the original on September 1, 2016. Retrieved February 2, 2012. Overbye, Dennis (8 June 2015). "Black Hole Hunters". NASA. Retrieved 8 June 2015. Overbye, Dennis; Corum, Jonathan; Drakeford, Jason (8 June 2015). "Video: Peering Into a Black Hole". The New York Times. ISSN 0362-4331. Retrieved 9 June 2015. ^ Pallab, Ghosh (10 April 2019). "First ever black hole image released". BBC News. Retrieved 12 April 2019. ^ "Black Hole Cam". blackholecam.org. Retrieved 12 April 2019. ^ "EU-funded scientists unveil first ever image of a black hole". erc.europa.eu. Retrieved 12 April 2019. ^ a b "Even Horizon Telescope Organization". eventhorizontelescope.org. Retrieved 2019-04-13. Shep Doeleman, on behalf of the EHT Collaboration (April 2019). "Focus on the First Event Horizon Telescope Results". The Astrophysical Journal Letters. Retrieved 2019-04-10. Overbye, Dennis (2019-04-10). "Black Hole Picture Revealed for the First Time". The New York Times. ISSN 0362-4331. Retrieved 2019-04-10. ^ a b Susanna Kohler (10 April 2019). "First Images of a Black Hole from the Event Horizon Telescope". AAS Nova. Retrieved 10 April 2019. ^ a b O'Neill, Ian (2 July 2015). "Event Horizon Telescope Will Probe Spacetime's Mysteries". Discovery News. Retrieved 2015-08-21. ^ "MIT Haystack Observatory: Astronomy Wideband VLBI Millimeter Wavelength". www.haystack.mit.edu. ^ Webb, Jonathan (8 January 2016). "Event horizon snapshot due in 2017". BBC News. Retrieved 2016-03-24. ^ a b Davide Castelvecchi (23 March 2017). "How to hunt for a black hole with a telescope the size of Earth". Nature. 543 (7646): 478–480. Bibcode:2017Natur.543..478C. doi:10.1038/543478a. PMID 28332538. ^ "EHT Status Update, December 15 2017". eventhorizontelescope.org. Retrieved 2018-02-09. ^ "The Hidden Shipping and Handling Behind That Black-Hole Picture". The Atlantic. Retrieved 2019-04-14. ^ Mearian, Lucas (18 August 2015). "Massive telescope array aims for black hole, gets gusher of data". Computerworld. Retrieved 2015-08-21. ^ Overbye, Dennis (April 10, 2019). "Black Hole Picture Revealed for the First Time – Astronomers at last have captured an image of the darkest entities in the cosmos". The New York Times. Retrieved April 10, 2019. ^ Landau, Elizabeth (April 10, 2019). "Black Hole Image Makes History". NASA. Retrieved April 10, 2019. ^ "Media Advisory: First Results from the Event Horizon Telescope to be Presented on April 10th". Event Horizon Telescope. 1 April 2019. Retrieved 10 April 2019. ^ Lu, Donna (April 12, 2019). "How do you name a black hole? It is actually pretty complicated". New Scientist. London. Retrieved April 12, 2019. “For the case of M87*, which is the designation of this black hole, a (very nice) name has been proposed, but it has not received an official IAU approval,” says Christensen. ^ Gardiner, Aidan (12 April 2018). "When a Black Hole Finally Reveals Itself, It Helps to Have Our Very Own Cosmic Reporter - Astronomers announced Wednesday that they had captured the first image of a black hole. The Times's Dennis Overbye answers readers' questions". The New York Times. Retrieved 15 April 2019. ^ a b c "Astronomers Capture First Image of a Black Hole". European Southern Observatory. 10 April 2019. Retrieved 10 April 2019. ^ a b Lisa Grossman, Emily Conover (10 April 2019). "The first picture of a black hole opens a new era of astrophysics". Science News. Retrieved 10 April 2019. ^ Jake Parks (10 April 2019). "The nature of M87: EHT's look at a supermassive black hole". Astronomy. Retrieved 10 April 2019. ^ a b c The Event Horizon Telescope Collaboration (2019). "First M87 Event Horizon Telescope Results. IV. Imaging the Central Supermassive Black Hole". ApJL. 87 (1): L4. doi:10.3847/2041-8213/ab0e85. ^ Högbom, Jan A. (1974). "Aperture Synthesis with a Non-Regular Distribution of Interferometer Baselines". Astronomy and Astrophysics Supplement. 15: 417–426. ^ SAO/NASA Astrophysics Data System (ADS): Seitz, Schneider, and Bartelmann (1998) Entropy-regularized maximum-likelihood cluster mass reconstruction cites Narayan and Nityananda 1986. ^ "The creation of the algorithm that made the first black hole image possible was led by MIT grad student Katie Bouman". TechCrunch. Retrieved 2019-04-15. ^ Narayan, Ramesh and Nityananda, Rajaram (1986) "Maximum entropy image restoration in astronomy" Annual Review of Astronomy and Astrophysics Volume 24 (A87-26730 10-90). Palo Alto, CA, Annual Reviews, Inc. p. 127–170. ^ "Affiliated Institutes". eventhorizontelescope.org. Retrieved 2019-04-10. This page was last edited on 18 April 2019, at 21:27 (UTC).